Experience: It is not necessary to have any previous experience on boat at sea. 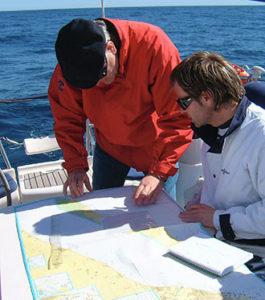 The Captain is fully qualified to manage the boat alone, but definitely for the student to learn the best way is to attend to the explanations and participate in the tasks of navigation and maneuvering, You may, with no doubt and if you wish, learn and help with the navigation. Your help will end up being very useful and fun for all. Sea sickness: If you have never navigated before we advise you to take a pill, particularly the first day. Your body will get accustomed to the movement and you will probably not need them. Travelling alone: If you are worried about this you will be surprised! The majority of those who have travelled with us demonstrate that it is well worth doing so. The kind of person who tries this experience is, like you, mainly open minded, wanting to learn, wanting to share and meet others with similar interests. We are very proud to say that many long lasting friendships were born on board. 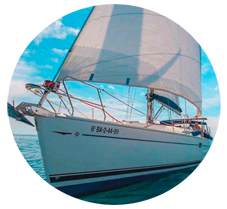 Do venture into the experience of travelling alone on a sailboat. 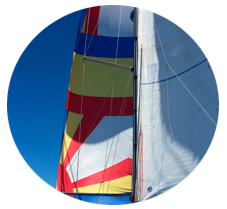 Accident insurance: We have contracted an insurance for the boat and civil responsibility towards third parties for those on board as well as an accident insurance for the crew. You may, nevertheless, contract a private trip cancellation insurance. Depending on the time of year you will have to think well about your luggage. It is always advised, even in summer, to bring some warm clothes because nights might be cool. A raincoat will be useful not so much for the rain but for the wind and to keep the chill off. Nautical shoes or shoes with white rubber soles will make it more comfortable to navigate and avoid slipping. Bear in mind that shoes or boots with black soles stain the deck. Sunscreen cream, even in winter is a recommended protection because the wind can also burn the skin. You can also bring a snack or sandwich for a day travel. Most of the time the body identifies as sea sickness what is actually hunger. Sleeping bag and front or flashlight for the guards. In the evening, the humidity increases the sensation of cold.